This month marks twenty years that my wife, Tanya Solomon, and I have been doing something really, really weird: performing as a viola duo. I know it's something 'those people' (violists) do from time to time... but never for two decades, non-stop. It's gotten a little out of control. It has been a fun twenty years! I expect that, in the comments section, some people might recommend us professional counseling. Just remember that, as a viola duo, we simply don't have that kind of money lying around. January 14, 2019 at 10:02 AM · Congratulations!! January 14, 2019 at 05:44 PM · Now that's an anniversary! Way to go! By the way you sound great -- going to look for your albums. January 14, 2019 at 05:47 PM · Scott I had an idea that I want to run past you. The Corelli Christmas Concerto has an essentially worthless viola part -- mostly doubling either cello or 2nds. I was thinking of rewriting the two violin solo parts for two violas -- what do you think? January 14, 2019 at 08:20 PM · Thank you, Jean and Paul! Paul, we only arranged that one movement of the Corelli (it's in a book called 'Twenty-tunes for Twenty-five Days of Christmas' at sheetmusicplus.) It was a bit more involved than just grabbing the violin lines, as the bass line and some of the middle harmonies were important, too. I think it'd be great if you went ahead and did the whole Christmas Concerto! First though, I'd go to www.violacentrism.com, scroll to the bottom and ask Cremonus what He thinks! January 14, 2019 at 09:38 PM · Excellent! 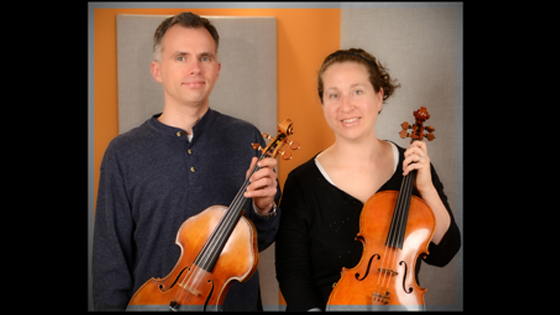 Anything that increases the duo viola repertoire is welcome, and you two are doing good stuff. January 15, 2019 at 03:33 PM · Inspiring! I must get my wife to join me on the viola..
January 16, 2019 at 03:51 PM · Tom, Melissa, Adrian, and 172.58.140.41, Thank you very much for taking the time to listen and for your kind comments! Now Tanya and I have to get working on the next twenty... starting with a new duo by Stephen Dankner! January 17, 2019 at 03:18 AM · I have to agree about the Bach solo works. Hearing them on viola gives the violinist a "fresh look" wherein different aspects of the voicings are, intrinsically, emphasized differently because of the lower register, revealing ideas that might well have been hidden even after hearing ten different violinists play these pieces. Especially so for the Chaconne, I must say. That's a real masterstroke of musical artistry. Are you familiar with the guitar compositions of Celso Machado? I have been playing and performing them with a jazz trio in which I play violin with a guitarist and a percussionist, and many of them might work well for two violas. January 19, 2019 at 01:21 AM · Congratulations Scott and Tanya! Here's to a further 20 of fine viola works. Thank you both so much for your contributions to this best of all instruments.